Venus body jewelry is more than just high quality metals and precious gems — it’s a re-thinking of body jewelry for the fashion-conscious consumer. It’s body jewelry, upgraded. Maria Tash was the first to offer secure, internally threaded jewelry in a 19 gauge (0.9mm) thickness, roughly the same thickness as earring posts that use a traditional "friction" or "butterfly" backing. Tash threaded jewelry is perfect for earlobe, ear cartilage, or nostril piercings, and offers all the benefits of internal threading without stretching your piercing to a larger gauge. Maria invented the first rings that use a hinge mechanism and "clicker" style closure to open and securely close on a scale appropriate for body jewelry, as an alternative to rings that twist open and closed. We offer this popular design in white, yellow, and rose gold, and commercial Grade 2 titanium. Maria Tash is on an enduring quest for the lowest possible gem settings. Our newest “invisible” setting achieves a look unlike anything else on the market, with the edge of the setting underneath the ridge of the diamond. For this look, Maria has each diamond notched below the girdle of the stone, and our precision setters carefully push specially-designed prongs into these notches to hold the stone securely. The resulting look is a diamond that seems to float on top of the skin, with the setting completely invisible. If you’re not wearing navel jewelry from Maria Tash, there's a good chance that your barbell isn't a very good fit for your body. Maria Tash specializes in true fit navel jewelry, which is curvier and sized specifically to each clients’ needs. Take a look at our navel jewelry size chart to see our true fit curves, or email us an image of your navel for size advice from our experienced piercers. 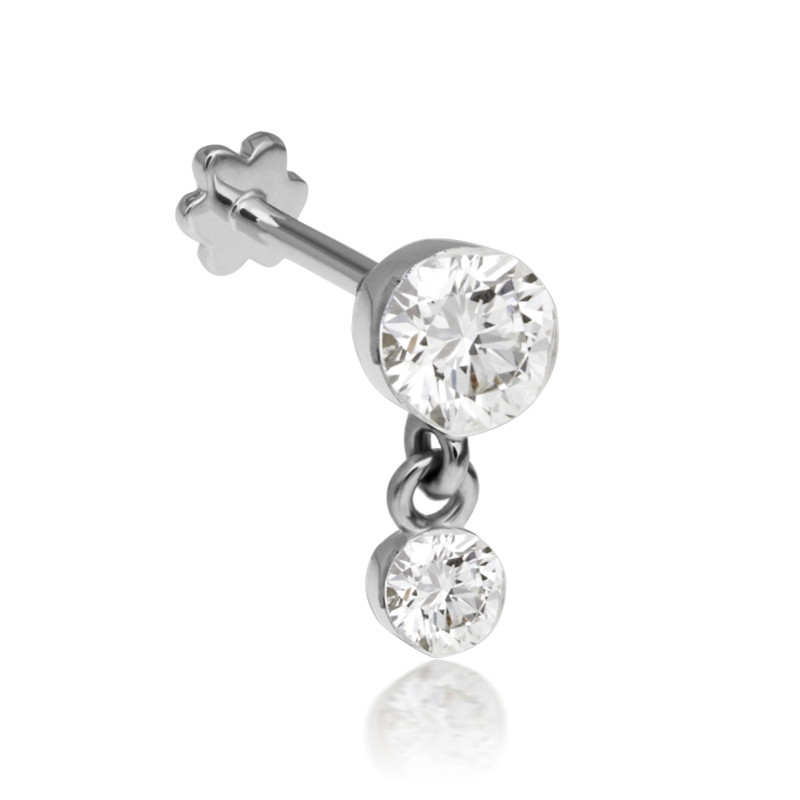 18k invisible set 3mm and 2mm diamond dangle threaded stud. Each diamond is specially notched and set in an invisible setting so that there are no prongs or cups over the top of the stone. The effect is that the diamonds float and sparkle on their own, invisibly. 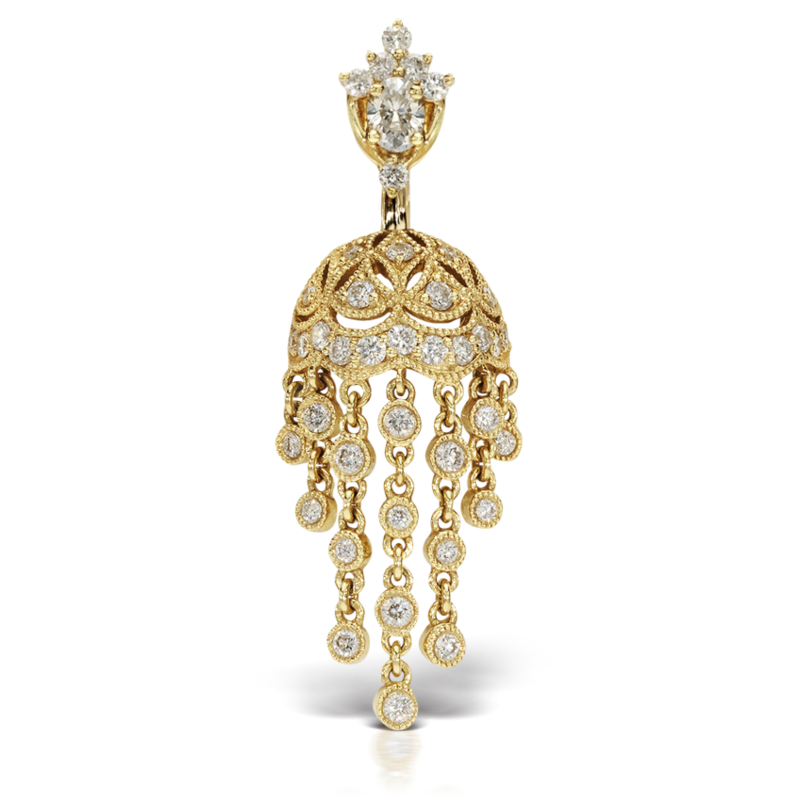 18k diamond tiara paired with our parasol dangle bottom. The flattering shape of Maria's signature Tiara top piece is described by an oval diamond, flanked by 6 round diamonds. 18k pear shaped scalloped edge bezel set diamond, accented by 3 round diamonds. 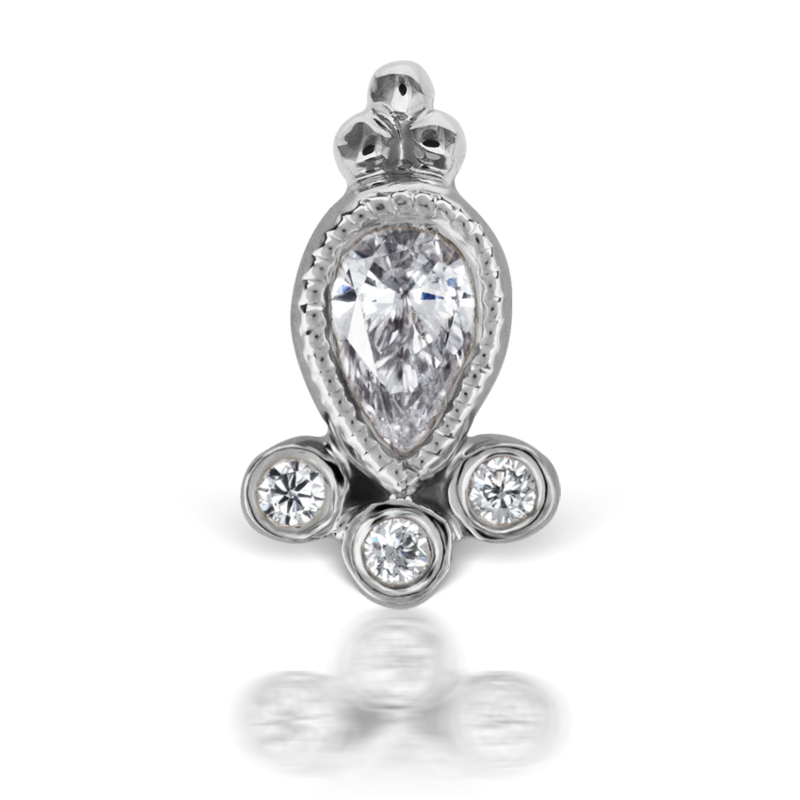 A miniature version of a signature Maria Tash pear shaped crown design.